One of the biggest advantages of investing in bank fixed deposit accounts is the easy availability of loans against fixed deposits. Unlike a lot of other investment options that need to be nullified when faced with a financial crunch, fixed deposits allow users to avail quick loans as high as 90% of their fixed deposit value. This not only increases the liquidity offering of the investment but also makes sure that the investment remains untouched and continues to compile interest for the loan tenure. Loans against fixed deposit accounts are structured similar to bank overdrafts although different banks have different rules for offering loans against fixed deposits. Almost all private and public sector banks offer users the options to avail loan facility against their fixed deposit investments. The banks however have fixed certain minimum period for fixed deposit investments to be in place before loan requests can be facilitated. The period of minimum investment varies from bank to bank and the bank is the final decision making authority in case of any requests from the fixed deposit account holders. For example some banks like HDFC bank usually offers loans only after a minimum six month period from the date of opening the fixed deposit account. 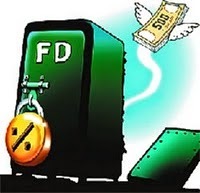 Public sector banks like State Bank of India or Punjab National Bank or PNB however do not have any such restrictions and loans against fixed deposits can be requested the very next day. Depending on the account type of the fixed deposit, loan facility is available for against all deposits including NRE / NRO / FCNR while still retaining ownership. However once a loan is sanctioned against a fixed deposit account, deposits cannot be prematurely withdrawn. For NRE and NRO fixed deposit accounts, 90% of the deposit amount is eligible as loan or overdraft limit. In case of an FCNR fixed deposit account, 70% of the deposit amount is available as loan. The Bank is the final authority on deciding the quantum of the loan for any fixed deposit account. Interest rate for loans against fixed deposits is usually 2 to 3% higher than the interest rate being offered for the underlying fixed deposit. For example if an individual has a fixed deposit of Rs. 1 Lakh earning a rate of interest of 9% per annum and taken a loan against the fixed deposit she or she will have to repay an interest rate of 11 to 11.5% which is 2 to 2.5% higher than the interest received through the fixed deposit. Most banks do not charge any processing fee while offering loans on fixed deposits. This is mainly because of secured nature of the loan. Some banks on the other hand have a policy of charging a small loan processing fee for every fixed deposit loan request. It is recommended to check with your bank about any such fee before opening a fixed deposit account. There is however no foreclosure fee or any extra charges in case a user decides to pay back the loan before its tenure or foreclose the loan.